The president's statement announcing plans to withdraw the United States from the worldwide Paris Climate Accord was a bad move for this country on many fronts, including PR. It's ironic that, in making his statement, he said the world has been laughing at us for this "bad deal, but they won't be laughing at us anymore." His arrogant dealings with EU and G7 leaders last week and his grand proclamation Thursday regarding the Paris Accord have quickly moved us from a position of world leadership and world respect to the back of the pack. In the process, the former “leader of the free world” is making himself irrelevant on the global stage. Despite his misguided rationale, based on flat-out wrong thinking on both climate change and economics, those who do understand the importance of global attempts to slow mankind’s destruction of our planet are taking action on their own and in concert with each other – ignoring the U.S. government’s official position. It is encouraging to see so many coming together to say that despite the official edict of the Administration, they will continue their efforts to adhere to green initiatives set out in the Paris Accord. As of this morning, less than 24 hours after the president’s grand reveal of his decision, which seemed more like the crowing of a new Apprentice or The Bachelorette winner, more than 90 major city mayors, governors of three of our largest states, and countless captains of industry have rejected the president’s position and made it clear they intend to work together toward lessening our carbon footprint. Proof that the president has made himself irrelevant on this important issue. At the same time, the chorus of disappointment and rejection by so many world leaders, including our closest allies, points out that our Administration stands alone on this crucial issue. The president said his decision was based on the need to put America first. Unfortunately, this move threatens to hurt American business, not to mention the health of future generations of Americans. Government support of alternative energy efforts could have created tens of thousands of new and lasting jobs here, instead of a few hundred low-paying and dangerous jobs at a coal mine the president said his efforts will soon open. China just announced major plans to expand its alternative energy initiatives, which it estimates will add hundreds of thousands of new manufacturing jobs and bring in something like $300 billion for the Chinese economy. Even if those numbers are exaggerated, it’s still a lot of jobs and money that could have been helping our economy right here at home. This is bad policy that is creating very bad PR for the United States. I hope the bad PR will be temporary, just as the bad policy will be minimized by the grass-roots efforts of state and local governments and companies who intend to ignore the president’s edict. Good PR will return eventually, with a new Administration that will set this bad policy and other negatives straight so that U.S. can again be “great again” in the eyes of the world. Nancy Silberkleit, a friend who is Co-CEO of Archie Comics, is a firm believer that comic books, or graphic novels as they are sometimes called, can teach and inspire. The iconic Archie series is often about teenage puppy love and the angst of growing up. But Nancy has used the Archie platform, as well as the comic book medium in general, to help young readers deal with issues like bullying and self confidence. She even formed a foundation called Rise Above Social Issues to help kids deal with the issue, and she is a frequent speaker through out the U.S. and as far abroad as India and Africa. Nancy also believes comics can inspire positive action. She recently added a teacher's guide to an Archie story titled "Get Drastic with Plastic," where Archie's pals Betty and Veronica, after hearing a speaker at school talk about the environmental impact of plastic, got their school and the community to do more to recycle. Nancy made the lesson plan available at no charge to teachers. Hats off to Nancy Silberkleit for showing how a medium many see as simply light entertainment can be used to inspire and promote responsible action. Robin Raj, founder of a branding agency in San Francisco, writes in Advertising Age this week about the risks of inaction on matters of global climate change. He says marketers can no longer be complacent about the issue, which is a very real and very ominous danger -- probably to us, and certainly to our children and their children. Raj says we marketers need to do what we can to support the World Wildlife Federation's Climate Savers initiative, which includes about two dozen powerful global marketers like Coca-Cola, IBM, Sony and others. They are trying to support a cap on carbon emissions, which will be the primary subject at the next Kyoto -- the global climate summit taking place in Copenhagen this December. Coincidentally, I heard more today about the Copenhagen summit and global climate change from another Californian -- Senator Barbara Boxer, who chairs the Senate Committee on Environment and Public Works. I was a guest at a small private luncheon across a conference table in New York, where Sen. Boxer gave us an update on happenings in Washington. She spent a great deal of the two hours talking about global warming and what Congress and the White House are trying to do. She first talked about the lack of action -- and in many cases, backwards action -- that we've had to live with over the past eight years. Sounding understandingly partisan, but in my opinion, honest, she is thrilled to have a President who "gets it" when it comes to the need for serious action on this front. She took us through a number of initiatives her committee and others in Congress and elsewhere are working on. I didn't want to start taking notes as I was sitting across from her at the table, but suffice it to say there's a lot that's happening... or a lot that can be happening if different bills can get out of committee and then approved on the Senate and House floors. Sen. Boxer, a Brooklyn girl who grew up not far from Ebbetts Field, knows she has a marketing challenge. She quickly realized that in the world of Congress, "green" is no longer in. The lawmakers know that their constituents are most concerned now about the economy and jobs, and the environment, while still impoprtant, has taken a back seat. So she's wisely put an economic spin on the initiatives, trying to show how action to curb climate change can be directly translated into infrastructure spending and jobs -- jobs that can't be done offshore, but rather right here by American workers. Fortunately, it's not just "spin." It's real. I wish Sen. Boxer success, because our future really does ride on it. My friend C.B. Whittemore, who writes at Flooring the Consumer, invited me to participate in Bathroom Blogfest '08. I responded in the affirmative before I knew exactly what this blogfest is. Bathroom Blogfest, in its second year, invites us to write about our customer experiences and the bathroom. I quickly realized I am way out of my league when it comes to Bathroom Blogfest. While I've spent probably more than my share of time in the bathroom, I don't consider myself expert enough to look for little shelves or all-white decor, or to make recommendations about bathrooms. Just give me a place to stand or sit and some toilet paper and I'm happy. If it doesn't smell bad, so much the better. But as I gave the subject more thought, I realize I do have something to offer -- not a recommendation, but an observation. I've seen a big change in New York City. It's become much more of a user-friendly city when it comes to public bathrooms. Some 20 years ago, just about the only public restrooms in midtown were in Grand Central Terminal or the Port Authority Bus Terminal. Neither were places you'd want to enter unless you had absolutely no other choice. Back then, I'd rather risk getting busted for public urination than use the Grand Central men's room in the evening while waiting for my train home. But that has all changed. The bathrooms at Grand Central are clean and well-kept. If you want to go a bit upscale, travel two blocks west on 42nd Street and use the bathrooms in Bryant Park, right behind the Public Library. Bryant Park used to be a dangerous place, even in the daytime -- populated by drug dealers, drug users and all sorts of derelicts and low-life. Now it's a beautiful urban oasis, and the bathrooms are spectacular. Fancy fixtures, very clean and they even have an impressive arrangement of fresh cut flowers. Even Times Square has clean public restrooms at the Times Square welcome center on 7th Avenue around 47th Street. Yes, New York has become user-friendly when you have to go. When you're done, put the seat down. The We Can Solve It Campaign, a project of The Alliance for Climate Protection -- a nonprofit, nonpartisan effort founded by Nobel laureate and former Vice President Al Gore -- got muzzled by ABC TV Tuesday night. The goal of the Alliance is to build a movement that creates the political will to solve the climate crisis -- in part through repowering America with 100 percent of its electricity from clean energy sources within 10 years. Our economy, national security, and climate can’t afford to wait, the group says, and I believe them after seeing Gore's film on global warming two years ago. The We Can Solve It campaign wanted to run an ad, which they were prepared to payt for, to air immediately after the Presidential debate. "Repowering" America is the message in the ad... and then some. The ad also attacks big oil, saying they spend millions on lobbyists (true), ads (true) and even scandals (perhaps. I don't know) to block legislation. It's ironic that the network lets the candidates take potshots at big oil in the debates, but they won't allow a non-profit group to run an ad. "ABC had Chevron. CBS had Exxon. CNN had the coal lobby. But you know what happened last night? ABC refused to run our Repower America ad -- the ad that takes on this same oil and coal lobby. I sent a letter asking ABC to reconsider their decision and put our ad on the air, but still we haven't heard back more than a week later." The solution to our climate crisis seems simple. Repower America with wind and solar. End our dependence on foreign oil. A stronger economy. All to increase their profits, while America suffers. We're the American people and we approve this message. I can understand the execs at ABC not wanting to upset some very big advertisers, especially in the current advertising and economic climate. But since they use the airwaves -- the public airwaves -- are they right to limit discussion of a critical issue? The networks run ads that slam competing products. They run ads by politicians slamming their opponents. Why should they be allowed to prohibit a legitimate non-profit group from putting its viewpoint out there? Pressure behind the scenes from big advertisers? Or just fear in the ABC boardroom that such pressure might be exerted or ads might be pulled. Either way, it sounds exactly like what the ad says is happening. We Can Solve It probably could have gotten the ad on the air if they were willing to hold back on some of the punches and soften the language and accusations critical of the oil companies. But would the message have had the intended impact? We Can Solve It just might end up getting more views and discussion because ABC refused to run the ad. It's bound to be talked about online in blogs like this, via email and eventually it may well get picked up in the mainstream news media.. except, of course, ABC. Some interesting ironies and challenges at play here, wouldn't you say? We all know that "green" is the new gold in marketing, from eco-friendly soaps to hybrid automobiles. Hybrid cars are becoming "in," as Hollywood stars are seen driving them, but they still represent a miniscule percentage of vehicles on the roads in the U.S.
Brandweek's cover story this week, titled "(not so) Green Machines," tells how Detroit (and Tokyo and Stuttgart) "hoot about their green machines...but are still cranking out more gunboats than ever." Back in 1955, when gasoline was under 20 cents/gallon, a V-8 Caddy got 13 mpg. Today's Cadillac Escalade, with a V-8, gets 14 mpg. More than 60,000 Escalades were sold in the U.S. last year. Toyota Prius hybrids, which get 45-50 mpg, sold some 185 units in 2007. Clearly, there's demand for cars with better gas mileage, and it's not only to save money. A survey of Prius owners showed nearly 2/3 bought a Prius because it makes a statement about who they are -- environmentally conscious. But even as the carmakers talk green in their ads and news releases, they continue to produce and market gas-guzzling monsters. They're just serving a market, some will say. True, but maybe, with much more than corporate profits at stake, the government needs to step in. Just as has been done with cigarettes, perhaps heavy usage taxes should be added to cars that exceed a certain mpg rate. It will push consumers to buy, and the car companies to pump out, vehicles that are less harmful to the environment. And those added tax revenues can go toward developing and implementing other more environment-friendly sources of power. 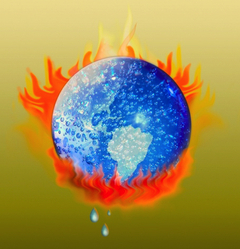 I know it seems draconian, but something drastic needs to be done, and soon, if we believe what the scientists are telling us about heading toward an environmental doomsday. If the car companies -- and we consumers -- are talking, but not walking the walk, maybe we need a push... before it's too late. I saw a story on the local news last night about the trend in fancy bottled water. I know I'm old-fashioned, but to me even a bottle of Poland Springs for $1 is a rip-off. 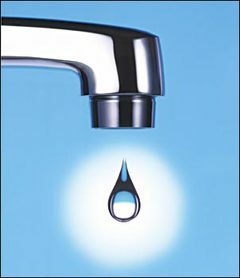 Many taste tests over the past few years have shown good ole' NY City tap water beats the pricey bottled water hands down. The TV news story talked about a bar in Westchester that has fancy bottled waters lined up on the wall. A glass will set you back a couple of dollars or more, depending what fancy brand you order. Think about it... bottled water at $1 per comes to more than $16/gallon. Kinda makes gas look like a real bargain. Congrats to the marketers behind the water brands. Good work, ladies and gents. You've built an $11 billion marketplace here in the U.S. And it's projected to grow by 90% over the next four years. But... aside from the price at the store, what other costs are there? According to a story in the Seattle Post Intelligencer back in April, an environmental think tank, the Earth Policy Institute, says that to make the plastic for all those water bottles burns up something like 1.5 million barrels of oil -- enough to power 100,000 cars for a year. 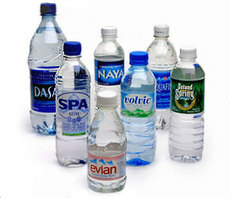 Nearly 90 percent of the bottles are not recycled, since most states have no return deposit on water bottles. There's more... "The bottled water industry is selling a vision of purity and people are buying it with the best of intentions," said a senior scientist at the Natural Water Defenses Council. "What they don't realize is that bottled water is actually much less regulated than tap water. There are a number of studies in which we find arsenic, disinfection byproducts and bacteria in bottled water." The FDA does allow trace levels of contaminants in bottled water based on the same criteria set by the Environmental Protection Agency for tap water. But on the FDA's web site, the agency also says, "Bottled water plants generally are assigned a low priority for inspection." So, go ahead -- enjoy your cold bottle of Poland Spring, Dasani, Evyan, Aquafina, et al. It's refreshing and you look fashionable. Me? Just pour me a tall glass from the tap.